Last edited by richard mook on Mon Oct 06, 2003 9:50 pm, edited 1 time in total. What a great piece. Excellent technical quality in both ikat and weaving and the ikat 'people' positively dance with character! I would give this textile house room any day. I have not been seeing the Philippines pieces - possibly US viz UK. Didn't notice them in Singapore recently when I was trawling the galleries. I like your suggestions for the forum and would like to stress that when the forum was re-launched it was as /community forum - so it is very much yours to develop. Thank you for sharing another piece from your very varied and interesting collection. The dancing figure in your wonderful ikat is first cousin to the infamous "frogman" who appears in various incarnations throughout SEAsia. Of course tribal textiles in the Philipines come from two distinct areas: firstly, tribes in the northern mountainous region of Luzon share many textile traits with both Hainan and Taiwanese aboriginal textiles (an Austronesian substratum). Secondly, the Islamic groups in Mindanao share textile traditions with the rest of Muslim Island SEAsia, although only in Mindanao is weaving with abaca fibers done to any extent. I'm afraid Philipine textiles have never been a favorite in the Bay Area. Most people are spending their money on Li textiles. Ethnic minority weaving in China, Vietnam, and Burma, and a renewed interest in tribal textiles, are what collectors are focusing on now (including me). When we were living in Hawaii, the Bishop Museum had an exhibition on Filipino culture in Hawaii. They had a few textiles and sold some in their shop. They were unfortunately quite expensive, and poor imitations of the real thing, unlike contemporary weavings from other areas. Even though I had done fieldwork in the Philippines, there was nothing there I wanted. You might check out their catalog for further information. Maybe the reason for different buying strategies on the West Coast also has to do with great interest in Central and South American textiles as well. But Filipino textiles are a no show around here. PS I know, I KNOW...coming soon photos of some of my collection. I promise! Olivier has reminded me of an excellent book on (southern) Filipino textiles: "There is a fantastic book about philippinese textiles "From the Rainbow's Varied Hue, textiles from the South Philippines" UCLA publisher. " I also have this book in my library. Some excellent quality photos including of the textiles. I found a book 'The last Filipino Head Hunters' by David Howard published by 'Last Gasp of San Francisco' when I was in Thailand last year. Full of photos of people showing some textiles but what I found stunning were the tatoos and the lovely character shots of the different elderly tribal men and women. I have a couple of Filipino blouses - nothing very special - that were in a sale at Joss Graham's Oriental Textiles gallery in Ebury St in London some years ago and somehow I just could not leave them in the shop! Cotton with cotton applique (where you might possibly expect to find beading). Eric Anderson who has a large collection of filipino textiles wondered if they might be Manobo, (Mindanao Island) as they have embroidered blouses. Any comments? Last edited by Pamela on Sat Sep 27, 2003 7:14 pm, edited 3 times in total. Your picture blocked out your text! Help! The Manobo are a large ethnic group, but some groups from Palawan also do garments that way. The picture did not block out any text. It occupied a space between two sentences! The last sentence must seem to be a non sequitur but I am afraid that there is nothing missing! I have edited the post and moved up the last sentence before the photo and put line spaces before and after the photo and added in a photo of the second textile - hope it is less confusing now. Thanks for all of your comments. I believe that there are a number of reasons why these textiles are not being seen in recent years at the same magnitude of the other SE Asian countries. First, even the adventure seekers have not deemed Mindanao a prime tourist area. The jungles are filled with gorilla activity focused on over throwing and changing the current government. However, there are still semi-isolated indigenous people, some of which are adhering to the past traditions including the weaving of textiles. Their scarcity alone precludes them from being a favorite in any area including the Bay area. It should be noted that outside of some of the major European holdings, the most noted collection of these textiles is in the Field Museum in Chicago, most of which were collected in the early 20th century shortly after the end of the Spanish-American War. There is a noted hole in the literature when it comes to these textiles. The Fowler Museum volume edited by Roy Hamilton is the first popular attempt to identify and describe the textiles of the culture sub-groups in the Southern Philippines. It is a most enjoyable book that is now available and very inexpensive. This along with, Reyes, â€šÃ„Ãº The Textiles of the Southern Philippinesâ€šÃ„Ã¹ are the only two books that I found commonly available that contribute to the knowledge beyond a brief overview. Any other references that you can make me aware of would be appreciated. In general, collecting trends are an interesting phenomenon. I always try to be on the front end before items, groups etc. become a fad. This way, chances are taken but the rewards far outweigh the risks. Early in the century art collecting trends including ethnographic art was being formulated and directed by few. In the US these were the groups exemplified by those who established many of our museums including the Metropolitan. There were adventure seekers on the West Coast too. Most notably men like Gump family in San Francisco. Later in the century, collecting trends expanded to people with more meager means and great collections were formed and now occupy many of our great museums in the Middle West USA. Some of these great collections remain under-utilized as holdings of our Universities. I would encourage all to inquire locally and you may be amazed at what is being stored with little or no knowledge of what they have. I may be challenging a few of you to get involved so that many of these great treasures may once again see the light of day where others can enjoy them. This is a big challenge for me in Kentucky and in the surrounding area. Finally, to end this sermon, I will make a prediction. Textile collecting at the level that is possible today, will no last much longer. Groups of quality textiles from the tribes in Mindanao and the Naga from India and Burma will be gone in a very short time, as tourism will not support their continued production. Those from Vietnam, Laos, Thailand etc. will no doubt follow the lead similar to what has occurred in Indonesia. This presents a unique opportunity for collectors that will no doubt adjust to the supply and demand for these items. 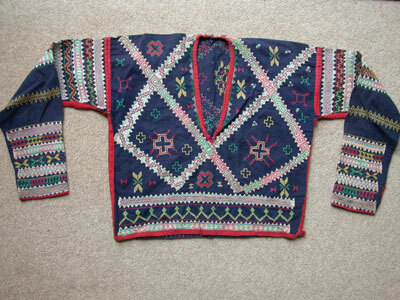 On page 101 is a illus showing female upper garments originating with the T'boli people of southern Mindanao. The lower example comes from S Cotabato and is described as being made from commercial plain woven cotton cloth with embroidery and appliique. It consistes of a black base material with broad bands on the sleeves and bottom border consisting of narrower bands in which zigzags and serrated teeth like patterns appear, mostly in red and yellow. The body of the garment has a bold geomertical design appliqued with yellow cloth outlined in red and again showing the charateristic edges made up of tiny triangles.The caption states that this garment is called kegal Kenibang. The T'boli appear to have another female upper garment with much denser, finer patterning in similar colours on the same black base and known as Kegal Nisif. Some further information on the first textile posted above:- On page 47 of 'The Rainbows's varied hue' is illus a female upper garment from the T'boli people. fig 1.48, again similar to those shown in the 'Sinaunang Habi'. 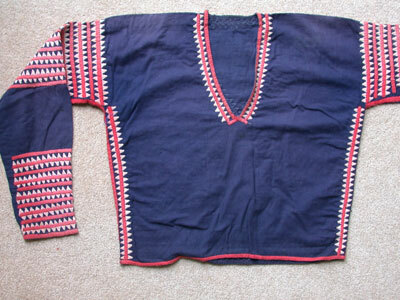 The text states that in recent decades medium or dark blue fabric was used for the base cloth but today black is preferred. Your comment that beads might have once been used is interesting, as other Mindanao groups make profuse use of small mostly white beads on similar upper garments, but the few examples I have seen from the T'boli are all applique and embriodery as ,in your example. I don't know if for some reason they have given up using beads or never had this tradition in the first place. Thank you very much indeed for your help in identifying my 2 textiles as T'boli. Yes, the first one is very similar to 1.48 on page 47 of 'From the Rainbow's Varied Hue' and the other one has very many 'tiny triangles' referred to in the first of your references Sinaunang Habi: Philippine Ancestral weave' Good to get the comment about blue in recent decades although today black is preferred. I have only received the 'Rainbow' book recently and then had to go away. It certainly requires a good read. I am very interested in the comments in your last post above. I am afraid that I am not very calculating when it comes to collecting but very much follow the heart. If I really like a piece - for superbe technique or asthetically - then that it was makes me add it to my collection. It would be good to think that my investment might come good in the not too distant future - although textile prices are generally pretty low in the UK when it comes to sales unless they are carpets. I certainly agree that we should be pressing our museums and galleries to show the textiles in their collections. What is interesting is that when they do the exhibitions are generally very popular but it is so hard to get them on show. There are many of us in the UK at the moment who are very disappointed that the British Museum is not showing its ethnographic textiles and since the closing of the Museum of Mankind (the ethnographic arm) very little has been on show. I don't even seem to see references to the BP showcases which were at least something. Can I please encourage people to share information on collections (via the Museums, Exhibtions, Events, Galleries and Websites forum please). We can then all try and keep up the pressure on our travels! I think that there are perhaps many subgroups of collectors; the first division being between the rich and not so rich! I grew up in Chicago, and spent many happy hours in both the Field Museum and the Art Institute of Chicago, where I took Saturday art lessons. The Art Institute also has (had?) a major textile collection, and many times I was required to copy these ancient items, AND then change them to fit "modern times". There is an active textile movement in the Bay Area, and the newly re-opened Asian Art Museum has much promise. UCBerkeley also has an ethnographic museum, which will also house our collection. The point I'm making is-what we collect really is a function of who we are, where we've traveled, and our own personal aesthetic. In the 70's I developed an intense interest in both Anatolian and Indonesian textiles as expressions of women's work. But suddenly the center shifted when Lao, Khmu, and SEAsian hilltribes began arriving. Anyone who ignored their rich textile heritage did so at their own peril! (By the way, what ever happened to Vietnamese textiles?). I like animals, bold prints, and unnatural dyes. Rummaging and begging have given almost all my pieces a very unique and personal history. I agree about the personal quirks of individual collections. Yes, what one collects depends so much on what in general one's circumstance and passions are at any particular time. For me my collection has also been influenced by my career, travel opportunities, available literature and recently by this forum. Such fun really as different factors push and pull in different directions. Oh, and I forgot sheer luck and happenstance! Richard, the photo in your post starting this thread is not available on Yahoo. Can you please do something about it as such a shame to lose it. Last edited by Pamela on Tue Jul 06, 2004 5:46 pm, edited 1 time in total.